In the annual UW Weather Station I had a hard time figuring out where the temperature ranked in the history of the region. The reason is that the records at the Waterloo-Wellington airport only go back to 1971 so to go back further we need to use a station in Kitchener that collected data from 1914 to 1977. Unfortunately between the stations there are going to be differences in equipment, personnel, and of course the location itself making comparison difficult. temperature of 7.90°C at 13th. However as there are 7 years of overlap between the stations I was able to calculate that the Kitchener station was an average of 0.74 degree warmer than the Waterloo-Wellington airport station. This difference was very consistent for all 7 years. So this puts 2010 as a tie for fifth overall. Lots of numbers there, but what I was interested in seeing were not the absolute numbers, but the order of the years. It is pretty obvious that 1998 was by far the warmest in the region and the fact that at most of the stations, the same years that were in the top 5 in the Waterloo Region (1998, 2006, 2001, 1999, and 1991) were generally not only in the top at other stations but also higher than 1953 and 1949. All this increased my confidence that the order of the adjusted Waterloo Region data is reasonable. This is the reasoning behind saying the 2010 was the 5th warmest year in the region since records began back in 1914. Up until the beginning of December it was looking to be a very warm fall. But since the start of the last month there have been only a few days that were above average. This brought the overall temperature for the fall down to half a degree above average, which is within the average range. The precipitation was relatively well spread out over the season with the only prolonged dry spell occurring between late October and mid-November. The total precipitation was 228.7 mm which is a little higher than the average of 220.9 mm, but still within the average range. For the second year in a row the total snowfall for the season of 30 cm was below the average of 40 cm and quite a bit lower than 2008 when we had 96 cm. After a few of the coldest days we have seen in a while (ie. since last winter), the temperature on Wednesday went above -6°C for the first time since Sunday evening. All together we recorded about 14 cm of snow from the storm on Sunday. November kept the streak going for 2010 with an overall temperature that was a degree hotter than average. We have now seen above average temperatures for each of the 11 months of the year. There was a regular hot streak from the 8th to the 14th and then a crazy 25 hours around the 22nd when it never went below 10 °C. On the graphs you can really see the difference in the daily cycle of temperature between the sunny/dry first half of the month and the cloudy/wet second half. So after that incredibly dry first half of November, the second half made up for it getting us into the average range for the month. The total precipitation for the month was 72.7 mm with almost half of that coming on two wet days (16.8 on the 16th and 17.4 on the 30th). We are now at 842.9 mm of precipitation for the year, a little above the average for this time which is 830.3 mm. It also looks likely that for the second year in row we will have an overall average year for precipitation. The forecasts have been bouncing around in the last few days, but now both Environment Canada and The Weather Network have us going below zero on Sunday morning and getting pretty close on Saturday morning. As the average first frost date is October 1st in the area, this year could be pretty much on schedule. It was a very hot summer, almost 2 degrees above average, making it the hottest summer since 2005. But of course without these last 3 relatively cool weeks at the end, it would have been even warmer overall. There was a big difference between the daytime highs and nighttime lows, the daily maximum temperatures were only a degree above average while the daily minimum temperatures were a full 2.5 degrees above. As far as precipitation, we had 314.6 mm compared to an average of 274.0 mm, this is still within the average range, albeit on the high end. The rain was not evenly distributed as 4 days accounted for over half of the season's precipitation. In the UW weather station Summer 2010 poll, it seemed that a lot of people liked the weather we had during the summer. The results were that 42% called it great, 31% good, 8% OK, 6% bad, and 10% called it a total washout. Thanks to the 179 people who entered the poll. Interestingly, although last summer was very different weather-wise, the poll results this year were pretty much exactly the same as last year. Does this mean that certain people will always love or hate the summer no matter what the weather? And that there are the same number of people that like the hotter summers as like the cooler summers? What did you think of the summer of 2010? As summer is coming to end next week it is time for the end of summer poll. I had a question about a red and white tower about 30 m tall near RIM park in north-east Waterloo. Apparently (I have not seen it) there is an anemometer on it and the person would like to know if the data are available. Please leave a comment on the blog if you have any information. 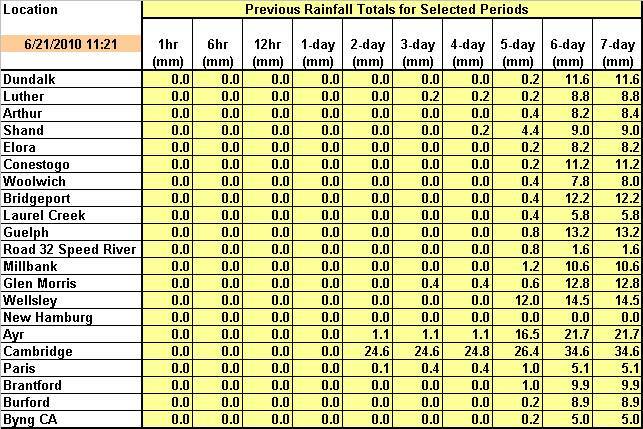 As pointed out by an anonymous commenter on the blog, we had more rain during a 24 hour period between the 2nd and the 3rd of September (51.9 mm) than we did for the entire month of August (36.2 mm). With an overall temperature over 2.5 degrees above average it was the hottest August since 1959. There was little relief from the heat as well, given that there were no days that were significantly (ie. more than 5 degrees) below average. We still have not seen a month this year that has been below average, making this the warmest first 8 months of the year since 1998, which was the hottest year on record in the area. It was a dry month with only 36.2 mm of precipitation when the average for August is 87.0 mm. Apart from a couple of days with around 10 mm, the rest of the month's precipitation were just a few sprinkles here and there. Of course a dry month is going to also put us further behind for the year. 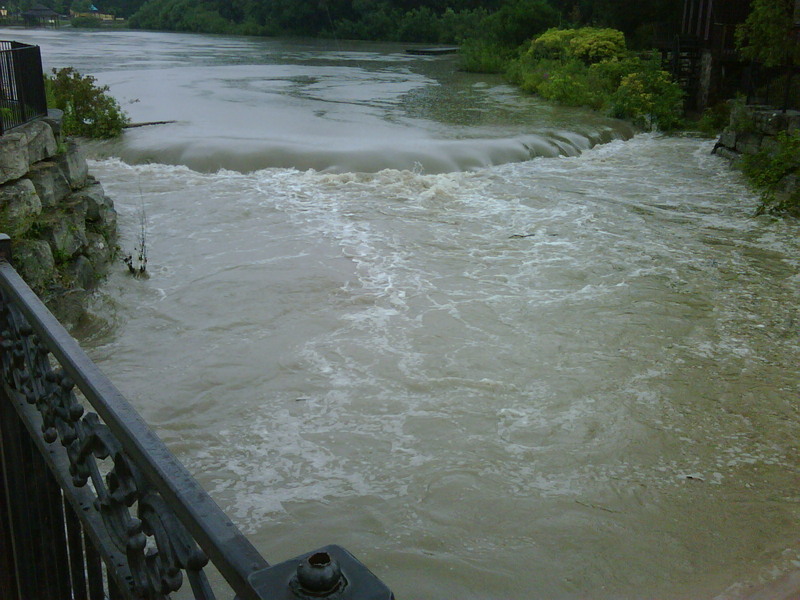 So far we have had 534.2 mm in 2010, compared to the average of 596.0 mm at the end of August. The high temperature only got up to 20.3°C on Thursday and the low on Friday morning went down to 7.5°C. These were the coldest daytime high and nighttime low temperatures that we have seen in almost 2 months. But of course a change is coming with 3 days of predicted highs over 30. The high temperature was only 21.5°C on Monday making it the lowest daytime high temperature since July 1st. Even with the rain we had over the weekend (about 13 mm) we still have only seen about one third of the average amount of precipitation for the month with a little over a week left. With the relatively wet June and July it doesn't look like most of the lawns around the area are really showing the effects of the dry August so far. As this is Waterloo, odds are a lot of people can identify the image below. But for those that don't know, it is called a QR code. Basically it is a method of linking to a website without having to type out the URL. 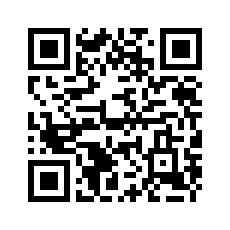 They are typically scanned in using smart phones which is why the QR code below links to the mobile version of the UW weather station site. By the way, this was sent in by David Carr and I think it is a cool use of new technology. So is this a useful addition to the UW weather station page? Is it big enough on the homepage? Is it too distracting? Please leave any comments you have about it. Had a few emails about this, so here are the current estimates for the Northern Light show peaks: 2 am Wed, 1 pm Wed, 8 pm Wed, 2 am Thurs EDT. Remember it may or not be visible in our area and will be most visible outside of the city lights. It was very hot for the first week of the month and then it was just a bit hot for the rest. Overall it was a full 2 degrees above average and about 4 degrees hotter than what we saw last year in July. The high temperature of 33.1 °C on the 5th was the warmest day since August 1st of 2007 and the 5 days in a row of temperatures over 30 (from the fourth to the eighth) was the first time that happened since 2005. On the night of the 5th (morning of 6th) the temperature only got down to 21.9 °C making it the warmest night since August 1st of 2006. The total precipitation of 129.2 mm was definitely way above the average of 92.9 mm for the month, but not close to the record of 223.2 mm in 1988. These last two very wet months have made up for the dry beginning to the year and we have now had the average precipitation for the first half of 2010. We woke up to a significant rain event Friday morning with 35.4 mm coming down between 7:45 am and 8:15 am. This translates to a 1 in 10 year precipitation event. Although that was definitely the peak of the event, between 7 and 9 am we got around 50 mm. 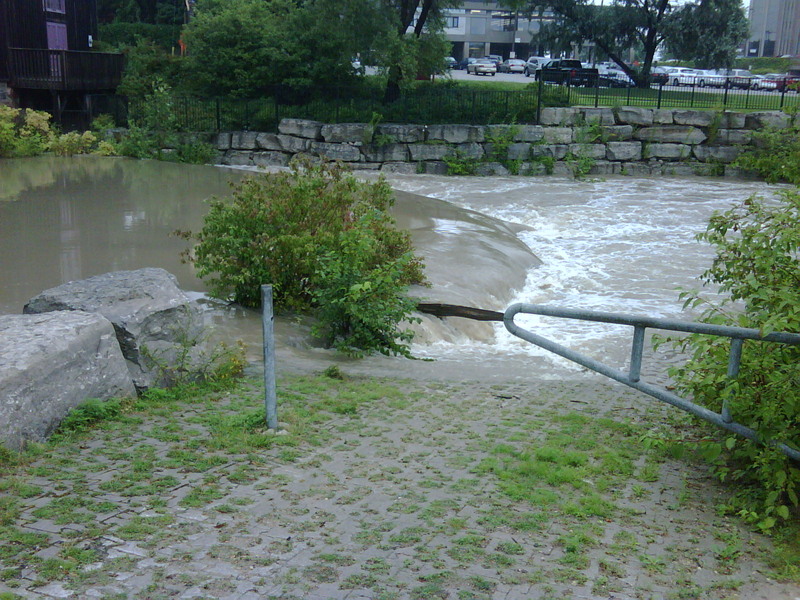 One factor that probably intensified the runoff was that we had received about 10 mm of rain overnight making the ground just that much more saturated. Thus the rain that hit in the morning was more likely to run directly off into the river systems instead of percolating into the ground. To show how localized the storm was the Grand River rain gauge in Brantford only recorded about 4 mm of precipitation this morning. It looks like this July we might not have a single day that is more than 5 degrees below average. Last year 10 days in July (ie. a third of the month) were that much colder than average. On Thursday evening, as the big storm started coming through, between 8:15 pm and 8:30 pm the temperature dropped 4.3 degrees and almost 7 degrees between 8 and 9 pm. It is very possible that these might end up being the largest temperature drops of the year. The first 11 days of July were a stunning 2.5 degrees above average. It is hot out there! The high temperature on Monday of 33.1°C was the hottest day since Aug 1, 2007. Also, if we get the forecast 5 days in a row over 30, that will be the first time that has happened since 2005. Apart from a 5 day cold stretch at the beginning of the month, the rest of June was pretty warm. Overall it was a full degree warmer than average, despite the fact that the highest temperature was only 28.3 °C, the lowest June high since 1993. But the real story was the precipitation, at 130.3 mm it was the wettest June since 1967 and the wettest of any month since December 2008. 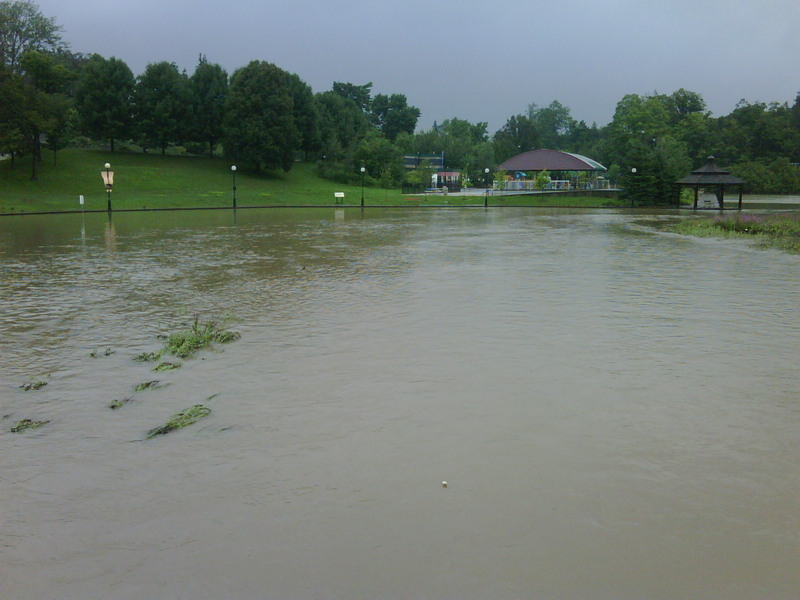 The rain was consistent with a large storm (over 10 mm) occurring at least once a week and 17 days with some precipitation compared to 12 days on average. But even with this really wet month the precipitation for the first half of the year is still a bit below average. We have had 372.3 mm so far in 2010 and the average at this point in the year is 415.0 mm. The updates and rewiring weren't 100% successful, sorry but I am going to have to take off the pressure again until we figure out what is happening with it. Looking at the precipitation report from the GRCA you can see that Cambridge was the only location in the area that got any rain this past Saturday. Crazy to see one location get almost 25 mm and Ayr getting 1 mm was the only other station that reported any. It was a full 2 degrees above average this Spring, making it the warmest since 1998. The warmth was pretty consistent with only a week of colder temperatures in May and a few in June that were significantly below average. Although we got around 25 mm more than the average precipitation for the season, this is still within the average range (albeit on the high side). It was also a feast or famine situation with the precipitation, as for most of it we would go a week or two without anything and then have a few very wet days in a row. After a dry first five months of year (none had more than average precipitation), June has come back with a vengeance. As of the halfway point of the month we have already had more precipitation (81.6 mm) than the average for the entire month (80.0 mm). These days near the summer solstice and when there are big puffy clouds in the sky are typically when we get the highest values of incoming solar radiation all year. In fact the readings are sometimes higher than the maximum incoming solar radiation which confuses some people. One has to remember that the maximum values are the maximum "direct" incoming solar radiation while the instruments we have at the UW weather station measure both "direct" and "reflected" solar radiation. So on days like today not only is the sun producing a lot of direct solar radiation but those big puffy (and white) clouds are also reflecting a lot of that solar radiation towards the sensor. Of course you also see really low readings as well when the direct solar radiation is blocked by one of those clouds. I have taken the "beta" tag off of the website as we now think that the station is somewhat stable. You may notice that we are using the precipitation gauge that only gives us the 1 hour readings and there are no pressure readings. I should been better at only putting readings on the station that came from stable instruments, for example, the lack of updated precipitation although it was on the website. I apologize for the confusion this created last week when it was raining and nothing was showing. In the future I will do my best to only display readings from instruments that we have confidence in. But note that the archive will contain all the readings as that's just the way we roll here at the UW weather station. We had problems with the equipment at the UW weather station during the month of May. As a result this summary is based on readings from the Environment Canada weather station at the Waterloo-Wellington Airport. It was the warmest May since 1999 with an overall temperature about one and half degrees above average. A cold snap from May 6th to 13th was offset by a very warm end to month where we saw temperature that were more summer-like. This makes 7 months in a row that the temperature was above average. The 67 mm of precipitation was a little less than the 75.7 mm average, but this is still within the average range. About 25 mm came down on the very wet May 7th. The building containing the computer that runs the weather station website will be part of a utilities shutdown this upcoming weekend. This may cause the weather station website to be unavailable at times, website updates will continue as soon as possible after any interruption. When the temperature only got up to 2.1°C on Friday, April 9th it was 6 degrees below average for that day. The last time we had a day that was that much below average was way back on January 29th when it was 8.5 degrees below. Although on a day like this we are really all winners, there can only be one winner of the 2010 UW weather station contest. who correctly chose a time of 1:00 pm on April 1st as the first time the temperature at the UW weather station would go above 20C and for the second year in a row we have a birthday winner!. contest, and will enter again next year. members of the Waterloo Weather Station Contest Hall of Fame. It was a very warm March with only 3 colder than average days, which all came at the end of the month. Overall it was 3.4 degrees above average, making it the warmest March since 2000 and the 6th warmest since records began in the region. There wasn't that much precipitation overall with only 48.4 mm falling compared to an average of 70.6 mm. This continues the dry trend as we are only at 107.2 mm where we would expect 187.6 mm at this time of the year. A majority of the precipitation fell during a 3 day period between the 12th and the 14th. But the big story is the lack of snowfall during the month, unfortunately it gets a bit difficult to directly compare to previous measurements, as the determination of snowfall amounts is a bit subjective. Although we didn't record any snow at the UW weather this March, the Environment Canada Waterloo-Wellington II station did have one day with 1.0 cm and another day with trace snowfall. You have to go back to 1946 when there were only 2 Trace amounts recorded to find a March that had less snow. So I think we can safely say it was the lowest snowfall for March in over 60 years and at least very close to the lowest snowfall total as far as records go back in the area. The entry period for the 2010 edition of the UW weather station contest has started. See all the details and enter the contest here. The entry period ends at 3 pm on Thursday March 4th, so get those guesses in. The last time we had a daily high temperature that was more than 5 degrees off the average (either above or below) was back on January 29th. Since then we have seen relatively steady daily high temperatures. By the way, this doesn't hold true for the daily low temperature where it has been both 5 degrees above and below the average a few times since the beginning of February. For the first half of February there has only been 5.5 mm of precipitation, the record low for the month is 10.8 mm. Although it looks like we are going to get some more this week, so far this snowfall season we have 0nly had 52 cm of snow. This is only half of the average of around 100 cm at this time of year and a quarter of where we were last year. Note that the extreme snowfall amounts are based on the measurements at the UW weather station so they only go back to the 2001-2002 snowfall season, while the average range is based on measurements from the Waterloo-Wellington airport from 1971-2000. A very cold start to the month was balanced by a warm second half (except for the last few days) to make for an overall average month for temperature. During that second half we had a stretch of 14 warmer than average days. The daily highs came in at 0.2 degrees below average and the daily low temperatures were 1.3 degrees above average. So overall it was 0.5 degrees above average which is still within the average range. But the big story for January was the lack of precipitation both solid and liquid. The total precipitation was only 27.9 mm, making it the driest January since 1981 and tied for the fourth driest since records began in the area in 1914. As far as snow, we only saw 17.5 cm. This is the least snowiest January since 1983, the seventh lowest total January snowfall in history, and less than half the average of 44 cm. It is understandable that people have been commenting on the lack of shovelling they have had to do this winter, as we have only had 47 cm so far this snowfall season compared to the average of 97 cm. It is also quite a contrast to last year when we had around 200 cm at this point. The high was only -4.1°C on Wednesday. That broke a streak of 14 days when the temperature was above average. Of the first 12 days of the year only two were warmer than average. Since then it has been above average every day. It looks like it will be warming up in a big way over the next week with some above zero temperatures being forecast by Friday. You can see below that these 3 agencies all have it getting warmer, although remember that they are not all looking at the exact same time period. So have we seen the harshest winter weather or as some longer range models are predicting will we be back to the frigid cold in early February? Time will tell. We didn’t see any really big extremes this year in the local weather, so the big weather story of the year would be the lack of summer-like temperatures. Between late June and early August it never went above 27°C for 44 days. The only time we experienced summer-like weather was during a single week in June and a couple more in August. However, take note that I never said that the lack of really warm temperatures was either good or bad, one thing I have learned over the years is that weather is very subjective and what one person considers a bad weather day is for someone else the most glorious day. Take for example this summer when even with the lack of hot weather, a poll on the weather station blog showed that 66% of people thought the weather was either good or great during the summer. Looking at the graph for temperature there is a lot of green and not a lot of red or blue. Overall it was 0.06 degrees below average for the year which is close enough to put it into the average range. This makes it the coldest year since 2003 and only the second one that was even a little below the 1971-2000 average in the 11 complete years of record at the University of Waterloo weather station. The year started off with a very cold January (the 6th coldest since records began back in 1915) but the rest of the winter and the early spring were warm. But then the middle of the year cooled off with July coming in as the 2nd coldest since 1915. It was interesting that the daily high temperatures for July were higher in Whitehorse than they were here. After August it was generally pretty warm except for a couple of cold streaks in late August and mid-October. Only October came in a bit below average while November was the warmest since 2001 at almost 3 degrees above average. There was a stretch of 27 straight days starting in November with above average daytime highs. The first four months of the year were very wet, with April being the wettest since 1996 and the 5th wettest since records began. Although we weren’t exactly in drought conditions for the next 5 months, each one was a little below average. Thus when we hit the driest part of the year in September, a stretch of only 15.3 mm in 27 days, the total for the year was back in the average range. If the largest single day precipitation of the year had not come on the 28th September, it would have been close to a record dry month. A wet October was then offset by a very dry November (the driest month of 2009) so that in the end, the final total precipitation of 899.1 mm was achingly close to the average of 904.0 mm. This comes after a very dry year in 2007 (671.9 mm) and a very wet year in 2008 (1159.5 mm). Although the 2008-09 snowfall season was tied for the third highest of all time, after January’s impressive 62.5 cm the rest of that winter and the beginning of the 2009-2010 winter have been relatively snow free. Thus for the calendar year of 2009 the snow total is only 128 cm, much less than the average of 159.5 cm. January 16: The last day of a really cold freeze where the temperature didn’t go above -10°C for over 3 days. On the 16th, with the high temperature of only -15.1°C, it was the lowest high temperature in almost 2 years. April 7: Final snowfall of the season that had a total of 235.0 cm. This season tied with 1942-1943 as the third highest total of all time behind both the 245.3 cm in 1923-24 and the 257.5 cm in 2007-08. April 24-25: After a chilly start to the day at 4.6°C the temperature went above 20°C by noon on the 24th and 23.6°C by the afternoon, it then started getting colder in the evening down to 13°C, but around midnight we saw the largest 15 minute temperature rise of the year of 4.2 degrees between 11:45 pm and midnight. It got warmer the next day with another high of 26°C, however between 3:45 and 4:45 pm the temperature dropped 10.1 degrees (a record at the UW weather station). I just thought it was interesting that the biggest temperature rise and drop happened on consecutive days. July: It was the second coldest July since records in the area began in 1915. We only had 2 days during the month where the high temperature was above average, so that made for 29 below average days. July 7: The high temperature only got up to 15.9°C. That was the lowest daytime July high temperature since 1997 and the fifth lowest since 1971. August 17: The temperature only got down to 21.8°C, it was the warmest night since August 1st, 2006 when it only went down to 25.3°C. September 28: The wettest single day of the year at 30.2 mm, although most of it (21.2 mm) came down between 6:45 and 8:15 am with the rest coming in a couple of smaller downpours in the afternoon. October 11: Sometimes the first frost day just kind of skirts below zero for a few 15 minute readings. But this time the temperature stayed below zero for a good 11 hours starting on the night of the 11th. December 4: It only got up to 0.3°C which was below average for the day. That broke a streak of 27 straight days of above average daytime highs. It was a very steady month for temperature with only 5 days that were either 5 degrees above or below average. With the daily high temperatures being 0.4 degrees below average and the daily low temperatures at 0.6 degrees above the overall temperature was 0.1 above average. However this is still within the average range. Looking at the graph you can also see how little the temperature went up and down with the diurnal cycle (ie. daily), but went up and down over the course of a few days. This is reflective of the large numbers of overcast days during the month when the temperature is not affected by the sun but rather by large weather systems moving through the area. Of the 79.6 mm of precipitation during the month, about 48 of them fell in the first 10 days which shows that the rest of the month was pretty dry. The average precipitation for the month is 71.1 mm so this month was at the top end but still within the average range. We had a little over 30 cm of snow this month which wasl a bit below the average of 38.5 cm.